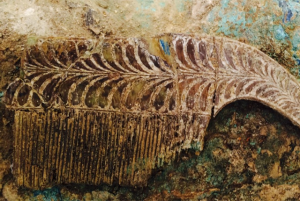 In the summer of 2015, archaeologists working in a previously unexplored field near the palace of Nestor at Pylos in southwestern Greece discovered an intact, early Mycenaean shaft grave burial dating to around 1500 B.C. 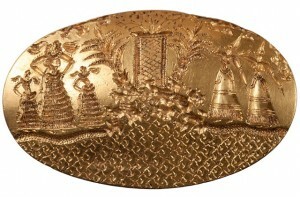 Within the tomb lay a single individual, a man surrounded by a wealth of weapons, gold jewelry, and other prestige objects. He might have been an early Pylian king, or a prominent local leader of some kind who helped found the early Pylian state, and he lived around the same time as the kings, queens, and other elite of the Mycenae Grave Circle A shaft graves; he may even have known some of them. The man, dubbed "the Griffin Warrior of Pylos" from an ivory plaque bearing a griffin found on his body, was 30-35 years old at the time of his death. Because the shaft grave roof had collapsed in antiquity, crushing his skeletonized remains, forensic anthropologists could not determine his cause of death or what diseases or injuries he might have had. 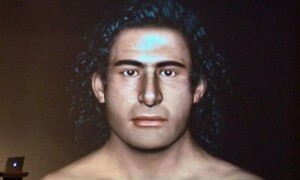 Remarkably, however, his skull was intact enough to do a facial reconstruction. Among his grave goods were many gold, bronze, and silver vessels, but no ceramics. He had six combs, including a very fine ivory one (below). Perhaps he, like later, Classical warriors, attached great importance to combing out his hair before battle. He had a boar-tusk helmet, at least two swords, a gold-hilted dagger, hundreds of semiprecious and gold beads, numerous carved seal stones, a bronze mirror, and several gold seal rings in the Minoan style, including one that is the second-largest such ring ever discovered. The seal ring above particularly fascinates me. There's a wealth of detail and iconography in this image of worshippers encountering divine figures at a seaside shrine. Just look at the workmanship of the waves! Initially I thought this and the other rings were included in the burial as shiny objects acquired on a raid (this was the period when Mycenaeans might have raided Minoan coastal sites prior to the 1450 B.C. takeover of Crete), but upon later research and reflection I see a different view. Of all the Mycenaean kingdoms, Pylos had the strongest economic, aesthetic, and cultural ties to Crete. The Griffin Warrior was buried with objects corresponding to scenes depicted on the seal rings. The Pylians understood Minoan religious iconography and incorporated it into their own culture. These rings must have belonged to the Griffin Warrior all along. The prospect of the Griffin Warrior owning rings depicting goddesses troubles me because I haven't been able to wrap my head around these intricate status objects. If you check out my earlier posts about Aegean Bronze Age seals, I talk about portrait seals and how they only depict men. Does that mean that only men used them? Did the Minoans understand portraiture as we do? The portrait seals depict such individuals that they must be of real people. I've thought about this. Why no portrait seals of women? In the Minoan and Mycenaean worlds, a woman's likeliest route to power was through the priesthood. Women controlled access to the spirit realm. Rings have been found showing priestesses carrying vestments, either to clothe a goddess or to don them herself in order to channel one. A priestess whose job it was to bring about the epiphany of a goddess would be the likeliest candidate to own a seal ring depicting an interaction with a goddess; she has no need for an individual portrait seal. A prominent figure like the Griffin Warrior would have been both warrior and priest, especially if he was a king. He owned and wore a goddess seal ring. So I must be wrong, unless the Minoans and Mycenaeans viewed the matter differently. He also had a seal ring depicting a bull, a symbol of male potency. The later rulers of Mycenae, warrior-king-priests also, set two lionesses rather than lions above their citadel gate. Gender differences seem not to have mattered when it came to the great powers. In the ancient world, you feared and took care to placate both the gods and the goddesses. So I'm back to Square One trying to understand this particular class of seal rings. How and by whom were they commissioned? Was it just a matter of being able to afford one, or did you have to be one of the priestly elite? We think of the wealthy and powerful as having just one, recognizable seal, such as those pressed into red wax to seal important letters or to sign weighty documents such as the Magna Carta. Why did the Griffin Warrior have six, then? How would he have used them?